On Saturday, October 1st, GCUOF and Garden2Table celebrated the organic garden through a fabulous dinner called ‘Garden to Table’. The guests enjoyed guided tours of the organic garden and a mouth watering cuisine, which featured Executive Chef Shea Robinson from Oliver & Bonacini Restaurant, Executive Chef Matthew Foote from Borealis Grille & Bar, and Executive Chef Simon Day from PJ's Restaurant in the Atrium. 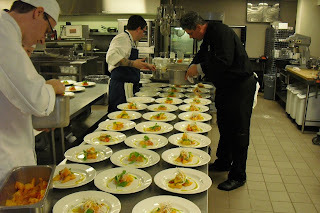 Utilizing the organic produce from the garden's seasonal bounty, the chefs created a delicious four course meal. Thanks to the beautiful, crisp fall weather, we were able to showcase the garden in its full glory. Thanks again to all the chefs and volunteers, who without them, we would not have been able to make this a successful event! Check out the upcoming events on the blog throughout the year!